On Sunday, temperatures will be at their coldest for possible two years in many places. Pictures: Sky News Weather. 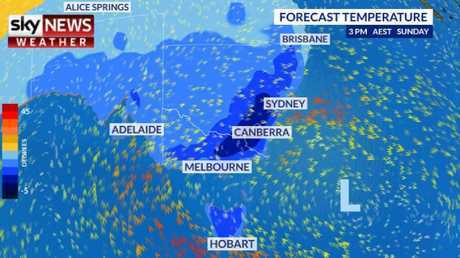 FORECASTERS have warned a "barrage" of cold fronts sweeping in across south eastern Australia could bring the coldest weather for two years. A bitterly cold weekend in Canberra will see temperatures fail to even make it into double figures and there's a possibility snow will fall on Parliament House. Flurries could fall from Mt Wellington in Hobart to as far north as the NSW Central Tablelands. "It's going to be extremely cold over the south east with a barrage of cold fronts coming, each bringing a burst of cold air, showers and very heavy snow as well," Sky News Weather meteorologist Tristan Meyers said. 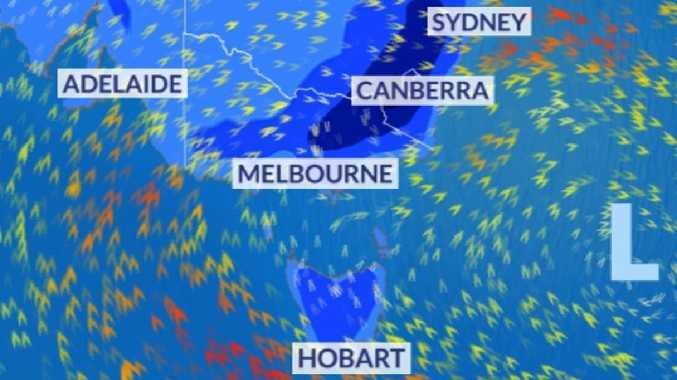 "Ahead of the cold front in Victoria we'll see very gusty northerly winds including over Port Phillip Bay (Melbourne) including gusts potentially as high as 70km/h and behind it the westerlies will feel very cold," Mr Meyers said. "The wind chill is a considerable thing to consider so even though there will be maximum temperatures of around 15C (in Adelaide, it will be colder in Hobart and Melbourne) it will feel much colder, maybe about 10C." On Thursday another "significant" cold front will barrel through on the same trajectory hitting Adelaide first and then Victoria and Tasmania. That front will include a low pressure system bringing further heavy rain and the chance of gales. And then, with barely a moment to pull on another layer, comes the main event: "Coming through on Friday and Saturday, this is the front bringing proper cooling," Mr Meyers said. "This one will bring temperatures potentially not seen for two years and at the very least we'll have one of the colder outbreaks we've seen this winter, it'll be very cold." "There is going to be snowfall and it's going to be heavy, potentially as much as a metre," he said. "It's getting cold enough (for the snow) to spread into NSW and maybe even the Central Tablelands could get snow on Sunday morning. It's going to be a very cold weekend ahead." 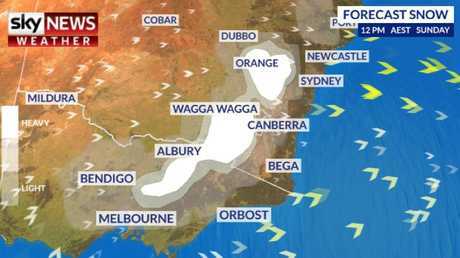 Snow could fall in Tasmania, Victoria and in NSW as far north as Orange. Picture: Sky News Weather. In the west it won't be cold but it could be wet. Mostly dry up to and including Saturday with highs of 22C and lows of around 8C. 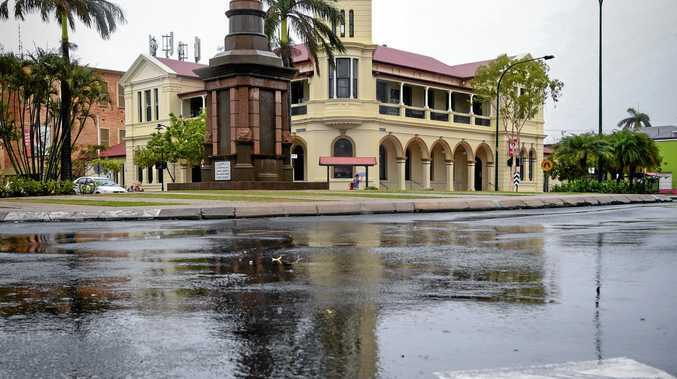 The rain will come on Sunday with potentially as much as 30mm on Monday.